Thank you for your review on "PRESSING THE ISSUE" by Daryl Wood Gerber! Really enjoyed the interview learning more about where she gets her inspiration as well as why the use of the Renaissance Fair in the book. It makes the book come alive to me even more so. 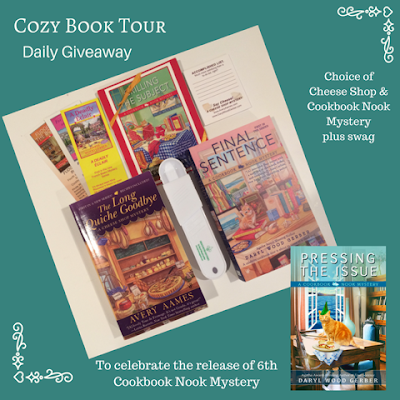 Thanks for the chance to win a great book by a wonderful author! I enjoyed this interview as much as the previous two. And A Wrinkle In Time is one of my favorite books as well. One of the first books to feature a strong female protagonist...and a teenager to boot! Interesting interview. Your book is fantastic! Great interview! Always interesting to find out how authors get their ideas/inspirations for their books. Great review as well, this series is definitely on my To Read list. Thanks for the chance to win! My daughter also loved A Wrinkle in Time. One of her favorite books as a kid. We would to read it to her before bed. She was probably about 8. She got a late start reading on her own but once she started, she hasn't stopped. I know she read the book herself more than once. I enjoyed the interview. I like learning more about my favorite authors. I am currently reading this series to get to the new one and I am really enjoying them. Thanks for the chance to win! Anne McCaffrey’s Dragons of Pern series - I love (and own) those books!! I read ND, too, and tracked down my 3 favorite titles from the series. Thanks for the giveaway. Can't wait to read the book! mcastor07 (at)Gmail(dot)com. Can't wait to read this - love this series!! ljbonkoski@yahoo.com Thanks for the chance to win! I can’t wait to read this book! I also loved A Wrinkle in Time. I had all of my children read it when they were young. Congratulations on your new release. Interesting interview. Love the cover. The inspirational ideas notebook was a perfect gift for you. Very sweet. I to loved Nancy Drew. I did not read Wrinkle in Time till I was married.I read it aloud to my new husband then to my kids as we travled.Hope the movie is not to far from the book.I enjoy your books and the characters I have met there. This is another new blog to me. 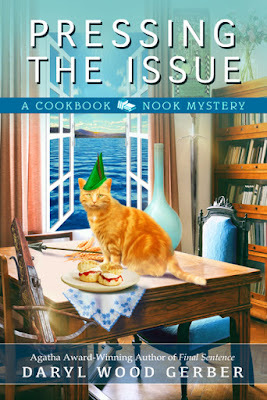 And another fine review of the newest Cookbook Nook book. I like the Renaissance Fair storyline. They are so much fun and I'm looking forward to reading "Pressing the Issue", sounds like another great book from Daryl. I’m really digging the different blogs that you are visiting and have book marked them to visit when I have escape time. This is sort of like visiting new friends each day. Thanks for another great rebiew of "PRESSING THE ISSUE" by Daryl Wood Gerber! I really need to request it at my library. I especially liked Daryl's comment about finding inspiration everywhere. I do "In the Bag" children's sermons at church and I find myself seeimg, hearing or reading something and trying to imagine how I could use it! Congratulations Connie! You are the winner for the daily giveaway! I sent you an email with all the info. I know I read A Wrinkle in Time but I don't really remember it and with the movie coming out, it makes me want to get it out and read it with my daughter. Read and loved this book! Never been to a Ren fair so it gave me some interesting visuals. Thanks for the great giveaway! 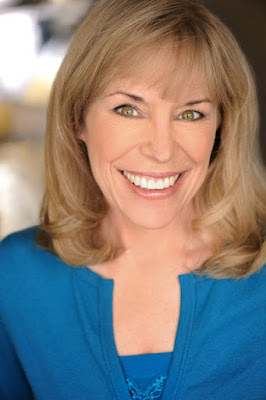 Amy Vansant had you connected to her links is how I found you. Great interview! I love that the king of the fair is based on your friend. I love learning more about how you come up with ideas and how you write, Daryl! This was another great interview!